Fido’s table manners. 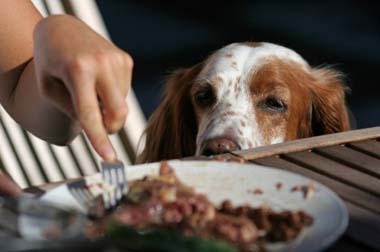 From distraction to restraining, there are some easy ways to keep your dog from begging for table scraps. One easy trick to try is simple distraction. If you begin to train your dog that each time you have dinner, he gets a treat, it will be easier to keep him from begging. A great way to do this is with a toy from a company like Kong. They make interactive chew toys that can be filled with peanut butter or treats. This keeps your dog busy the entire time you are eating, and not only that, he will come to know that each time you get ready to sit down for dinner, he is getting his Kong. 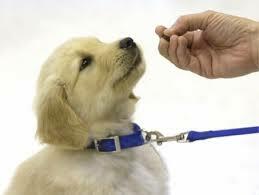 If you have crate trained your dog, it is easy to direct him to his crate during meal times. Simply give him a treat so that going into the crate is not a punishment, but more of a reward for his good behavior during meal times. Another, somewhat simple, way to keep your dog from begging during meal times is never to get him started on people food in the first place. If you begin by feeding your dog during your dinner time, and never share your food with him, he will not get a taste for human food at all. If you both eat at the same time, begging won’t be a problem. This also means that you must keep your guests from sneaking your dog scraps from the table, too. We all know a family member or friend who just cannot help it, and hates to say no to a dog. Just let them know that you have trained your dog not to beg, and ask them please not to share their food with your pup. There are several ways to perfect your dog’s table manners, and starting with these from an early age are key. Good luck! Children, drinks, and even grocery bags, have secure places to ride within a vehicle, but what about Dog-Kids? Gone are the days of only taking Fido on car rides for yearly vet visits. As more humans live in urban areas, we like to bring our pets on hikes, to playgrounds made just for them to play with other pets and even to stores that cater to their needs. Pets commonly ride in vehicles, and now some manufacturers are making vehicles with these pets in mind. Safety and comfort are the two top priorities when it comes to transporting your pup. The Jeep Liberty Offers tons of extras made just for pet owners to fit perfectly into the model. It also has back seats that fold down, and allow your pet and his buddies room for the ride that is comparable to the back of a pick up but safer. The Dodge Journey offers something that not many vehicles have, it has a cooler in the dash to keep water so you and your pet can stay hydrated after a hike in the woods. This SUV is rated high on safety and off road capabilities as well. This vehicle can go off road, so taking your pet off the beaten path is safe and easy. 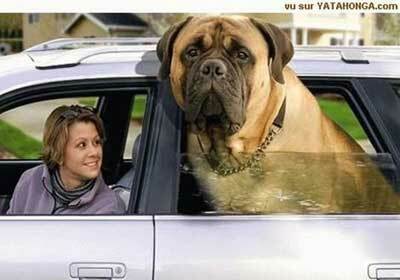 Side Curtain Airbags, will protect the four legged passengers in the passenger, or back seat. While they ride in comfort on the leather upholstery. Remember to keep your pet safe while on the road by keeping lose items secure in the vehicle and not allowing them to hang their head out the window unless you are going really slow down a back road. Sometimes pet kids can become overwhelming when they develop discipline problems. It can be frustrating to find the furniture, or shoes ruined, or to have the neighbors complain about the noise. Most pet behavior problems can be addressed if the owner is willing to put in the time and show both discipline and patience. Chewing. Puppies are going to chew, and should have plenty of safe toys to ease their gums on. However, when the chewing returns after teething and it ruins your things there is likely an issue that needs to be addressed. Barking. Many people get a dog because of the security of having a dog bark at intruders, however some dogs take this to an extreme that interrupts the sleep of the entire neighborhood. Defecating or urinating inside after potty training has been accomplished. If a pet starts eliminating inside the house after he/she has already been trained, there is likely an underlying issue that needs to be addressed. Do not be too harsh, because the issue may be medical. Jumping. Dogs just love company, and greeting their family when everyone comes home. However jumping can hurt, and ruin clothing there are ways to deter jumping without hurting the dogs excited, loving feelings. Chasing. Dogs have had jobs in the past, and they get bored. Chasing is a way for a dog to work, but it can be very dangerous to the dogs life and must be addressed by offering the dog a different “job” to pass the time. Something like finding a hidden toy, and leading on long walks. Begging. This bad habit is likely a direct result of the dog being given treats during human meal time. It may be cute, but it is also likely a hindrance when attempting to have a family meal. Growling or biting. This may be the worst habit of a dog because it endangers other people. Even a small breed can cause the need for stitches. Addressing this behavior is of up most importance. All of these discipline problems can make pets hard to handle, but treating most problems is a matter of putting in time and addressing each issue individually. After making sure that the bad habit is not caused by a health problem, training techniques such as distraction, rewards, set schedules, and addressing issued early on before they become habits can make life much more peaceful for Fido. Some dogs, especially smaller, more anxious breeds, tend to have issues with thunder and other loud noises. In most cases, those dogs that are afraid of thunder tend to exhibit a set of behaviors that are difficult for owners to treat without taking the time to truly consider what is happening. The first symptom that owners may notice that points to a phobia of thunder is hunkering down or crouching when thunder is heard. This may mean that dogs are more aggressive when there is thunder and they are hunkered down in this defensive pose. It is important that owners understand that these dogs are not capable of understanding that there is no reason to be scared and should therefore be treated with care. Another behavior you may notice is wetting, this means wetting themselves or their beds when they hear thunder. Again, this is not the fault of the dog and which should be considered when this behavior is discovered. 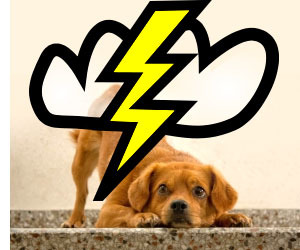 Some other behaviors may be barking, whimpering, hiding, and even running around when thunder is being experienced. The best way to treat this type of phobia is to first take the time to show your pet that there is nothing to fear. This may mean taking them up in your lap when there is thunder, talk to them in a soothing voice, associate thunder with a positive reinforcement like treats or snuggles. Another way to help treat this is to allow your pet to find a safe place where they feel as if the thunder will not hurt them. This could be a crate, a bed, a special blanket, and more. The most important thing to remember is that your pet needs you and being patient is the best way to help them get over their phobias. The idea of a cuddly, loving dog anxiously awaiting your arrival at the front door is something that is appealing to almost everyone. Who wouldn’t want to come home to someone who is constantly happy to see them? But when it comes down to it, a lot of people aren’t cut out for the commitment of being a dog owner. A dog is an addition to the family that needs the same love and care as a small child would. Before jumping into responsibilities that your family cannot handle, you should ask yourself the following questions. Do I have the time needed to dedicate to a dog? The dog will require extra attention, especially in the beginning when everything is still new. Unlike humans, who can handle activities by themselves such as using the bathroom at any time with ease or grabbing food and water from the fridge, a dog depends on you for these things. Is everyone in my household comfortable around dogs? Some people simply are not fans of animals, and allergies can be problematic. You wouldn’t want to get an animal that your family falls in love with only to find out that you need to get rid of it because of little Sally’s unexpected, yet serious allergies. Am I financially prepared to support a dog throughout its entire life? The dog will need you to provide food and toys, and you will need to pay for veterinarian expenses, etc. If you’re away from home for longer than your average workday, you will have to think about hiring a dog walker or making plans for a neighbor or friend to feed and walk your dog. If these are things you cannot handle, you are probably not ready for a family dog. Motion Sickness in Dogs: Is Your Dog Car Sick? If you’re a dog owner that loves to take your pet along for the ride, you and your dog have probably dealt with motion sickness at some point. What causes motion sickness, and more importantly, what can you do about it? In puppies, motion sickness is common because the inner ear is not fully developed. Among adult dogs, motion sickness is often triggered by stress. 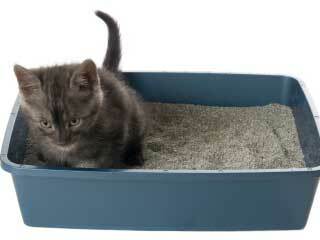 They can associate car rides with past bouts of vomiting or unpleasant trips to the vet. However, if your dog normally enjoys car rides, there could be an underlying medical reason for his motion sickness. Ask your vet about side effects from medication, ear infections and other ear conditions. If your dog is not used to traveling in the car, the best thing you can do is start slow. On the first day of training, sit with your dog in a running vehicle for a few minutes. The next day, you can add a step by backing out of the driveway and pulling back in. After several days of baby steps, your dog should be able to handle 20 to 30 minute excursions. Don’t let your dog become overly anxious – if he becomes nervous, stop for the day so that he doesn’t start to form negative associations. If you and your dog are experiencing difficulty overcoming motion sickness, there are a few things you can try to make him feel more relaxed. Keep the interior of the car at a comfortable temperature, and roll the windows down an inch or two so that there is a constant supply of fresh air. Bring something from home – like your dog’s favorite blanket – to help him feel cozy. You can also make car rides extra fun by giving him special toys and treats that are reserved only for traveling.